Lucien Goethals was born in 1931 in Ghent, Belgium. He completed his musical education at the Royal Academy Of Music in 1956 where he was awarded the highest accolades for advanced organ, history of music and theoretic notions, after which he eventually pursued his studies of seriated music technique and electronic composition with GM Koenig. He was awarded further awards for composition in both his own country as well as abroad and was a member of the renowned Spectra work group. In 1963 he was appointed to the post of producer of the BRT (Flemish division of the Belgian Broadcasting & Television System) and later a key producer in the division known as IPEM (Institute for Psycho-acoustics and Electronic Music). From 1971 he taught musical analysis at the Music Academy of Ghent. 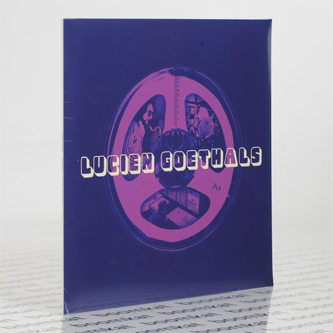 Goethals was an exponent of the stricter direction in the aesthetics of contemporary music. His work is still recognised as a valuable contribution, on a global scale, to the fields of seriated and trans-aleatoric music of the past half century. His recorded achievements within experimental music include a dozen rare compositions for solo ‘magnetophonic’ music and a set of works for combined orthodox instruments with magnétaphone. Outside of the electronic field Goethals was also recognised for his chamber music, symphonic orchestration, cantata and lied compositions. This compendium focuses on Lucien’s magnetophonic work recorded during, and prior.